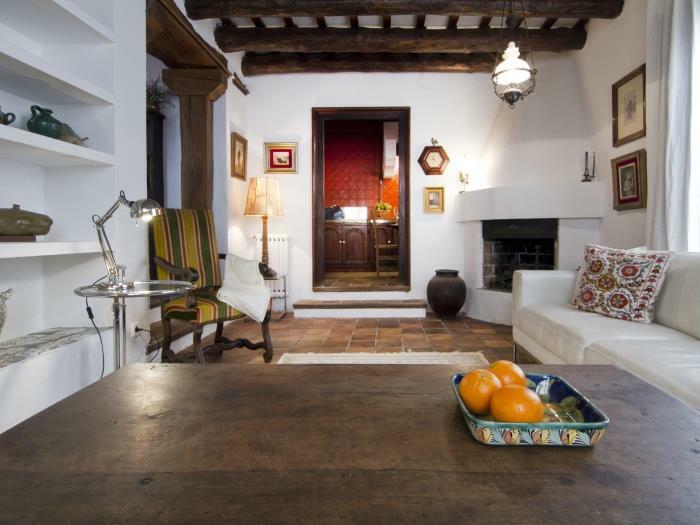 The ANTIK CHARM VILLA in Sitges has been beautifully restored and partly modernized with all the mod cons in mind but also trying to maintain its antique charm and the typical features of a traditional Mediterranean house such as beamed ceilings, white washed walls, wooden shutters and wrought iron bars. 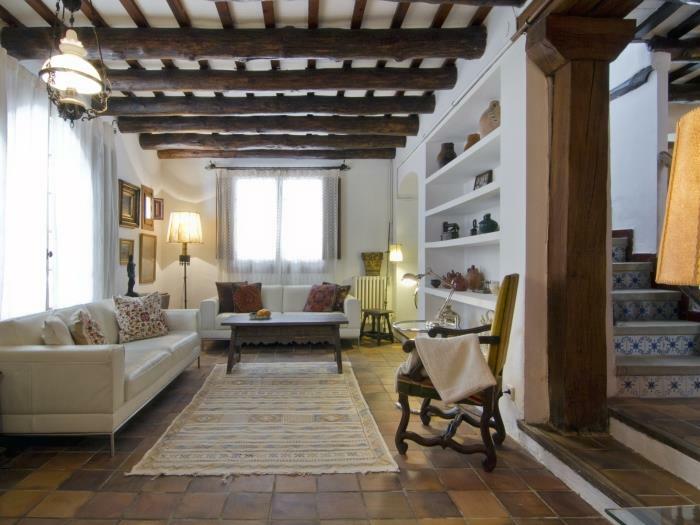 This Catalan townhouse oozes style and provides a unique opportunity to enjoy the best of a modern holiday stay while experiencing a little bit of history. 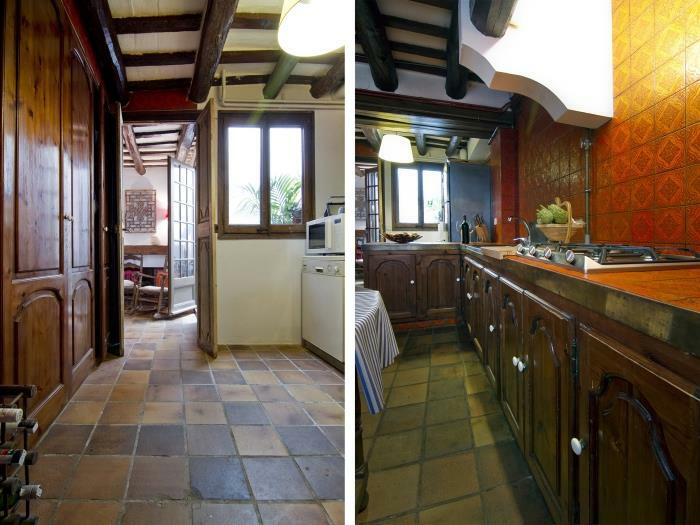 Despite its town central location the house offers a haven of tranquility on a spacious accommodation arranged across 3 floors. 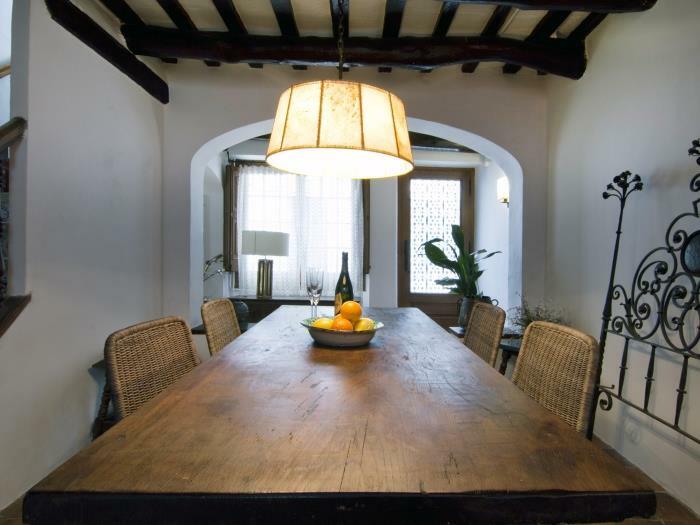 The house entrance leads directly into the attractive dining room with an old solid wooden table and chairs. There are also two wooden rocking chairs, a fireplace (not in use) and some old pieces of furniture that give a special touch to the area. 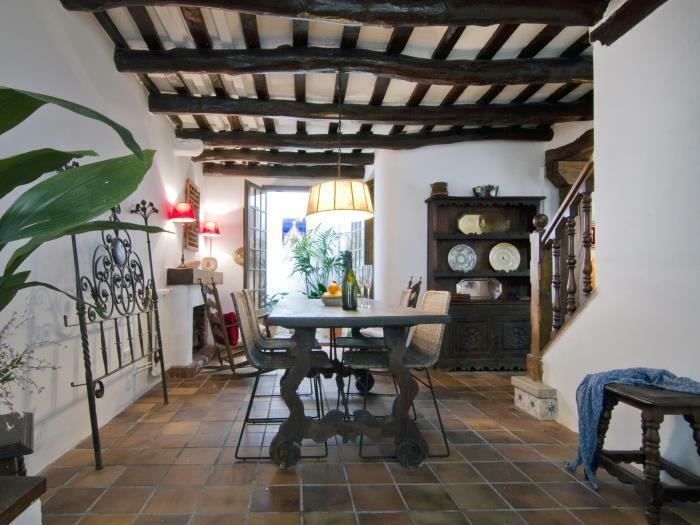 The dining area leads into a small courtyard (open to the sky) with a beautiful collection of local plants. From here our guests will find the kitchen, which maintains its original cupboards and charm but all electric appliances as oven, cooker, fridge/freezer and even the sink have been modernized for our guest’s comfort. The kitchen is large enough to fit a small round table and two chairs, perfect to have a quick breakfast before jumping to the beach. 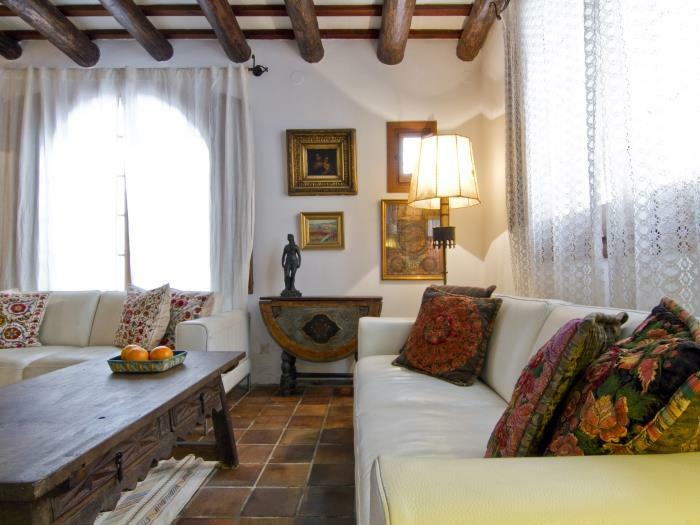 Furthermore, on the street level, our guests will find a large room with two white sofas seating three people each, an armchair, a fireplace, a small collection of Catalan pottery and old paintings from local artists on the walls. 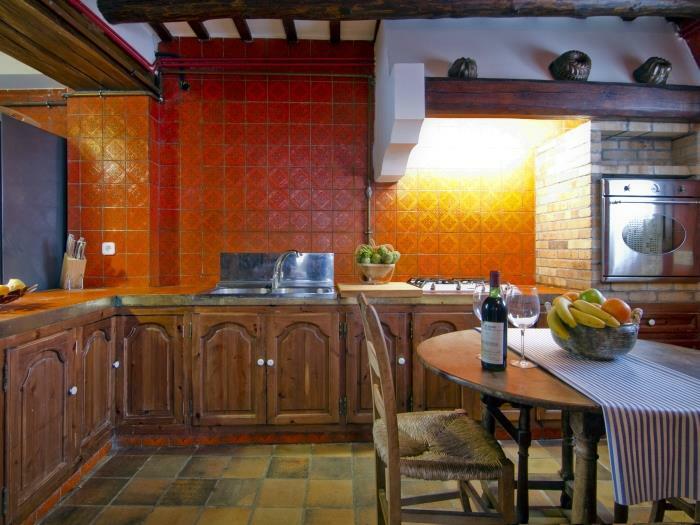 This area is directly connected with the kitchen and the above mentioned dining area. 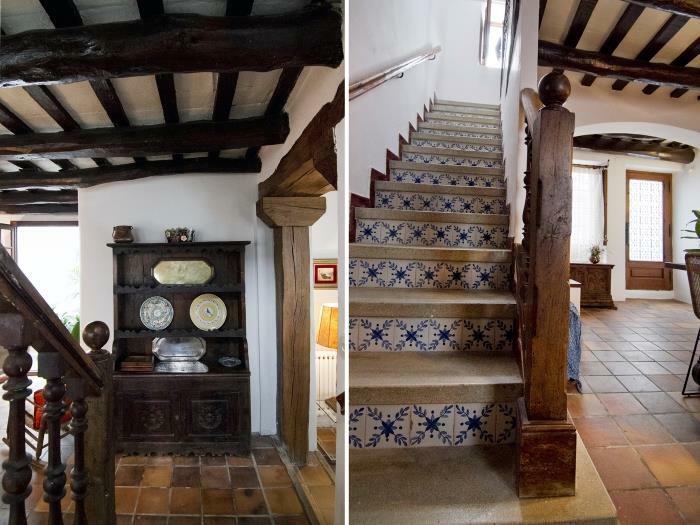 A flight of stairs with beautiful blue and white tiles lead up to the first floor where our guests will find all the bedrooms. 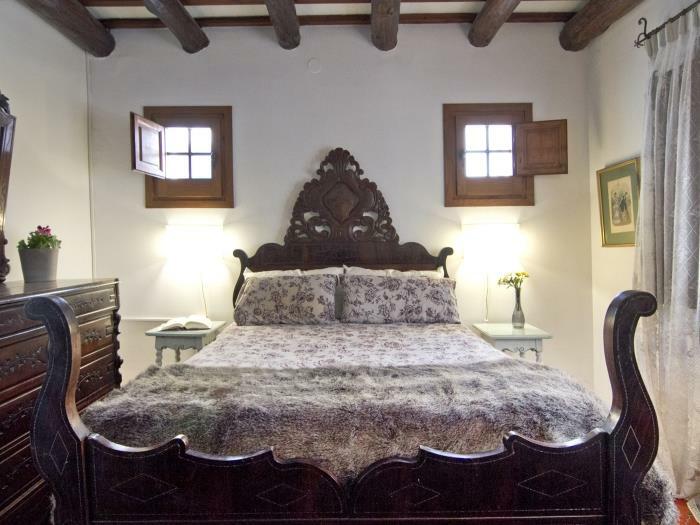 The master bedroom features an impressive solid wooden double bed with headboard also made of carved wood. 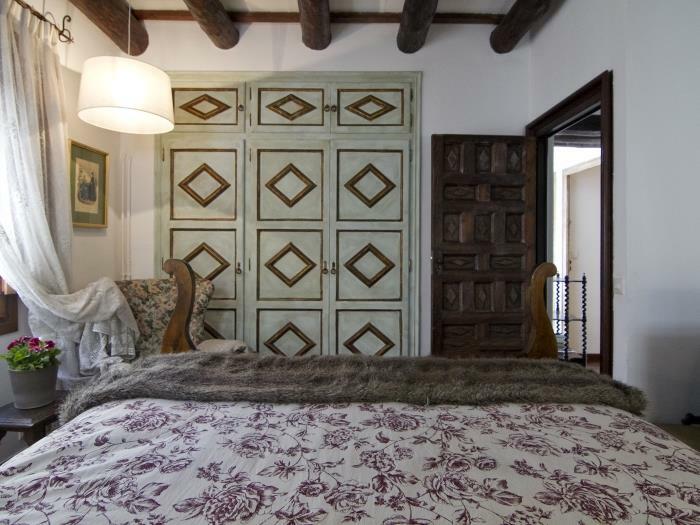 There are three more bedrooms on this level, two of them with a double bed each and the last one with two single beds, one hidden under the other, so the villa can comfortably accommodate up to 8 guests in 4 double bedrooms. 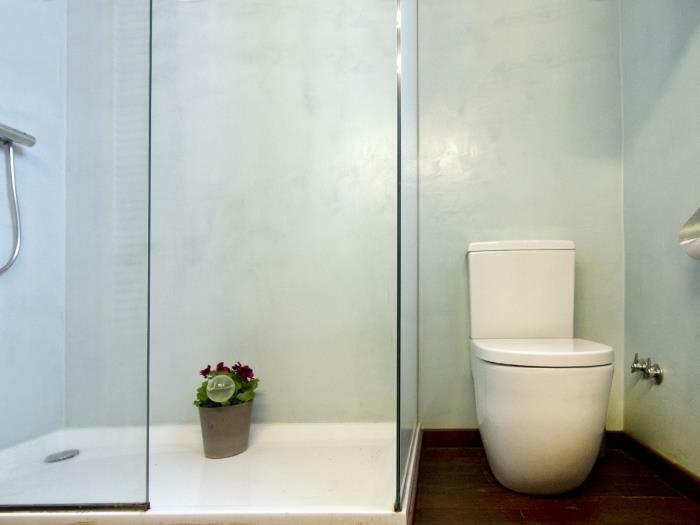 There are two modern bathrooms on the first floor, each one with a walk in shower, hand basin and WC. Further up, on the second floor, our guests will find a large polyvalent room with different areas including a study area with a large glass table ideal for computer working, a lounge area with a sofa, a flat screen TV and two arm chairs and another chill out area with a beautiful sofa with iron structure and cushions imitating old mattresses, the perfect spot for a little quiet relaxation. 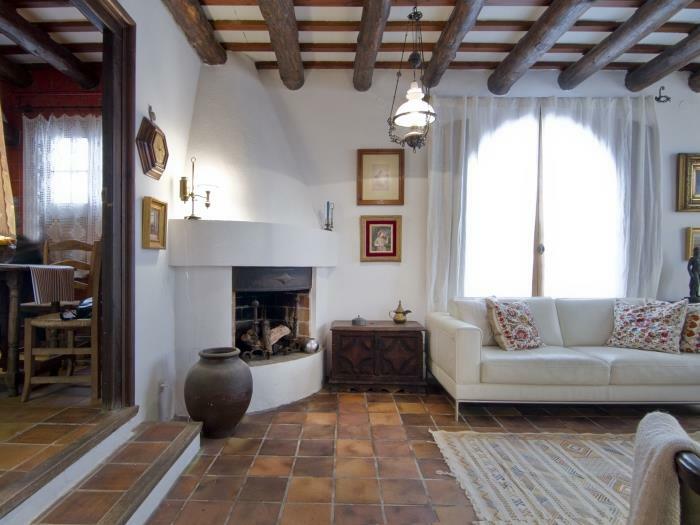 But the highlight of this level and also of the entire property is the large and well-appointed terrace that opens up from the polyvalent room. The terrace has an L shape sofa, some extra chairs and lots of local plants, most of the year, with flowers. This terrace is a very special place to relax with your family or friends and recall all the exciting adventures lived during a stressful sightseeing day, while sharing a glass of your favorite drink. You will sure enjoy some memorable evenings on this terrace! 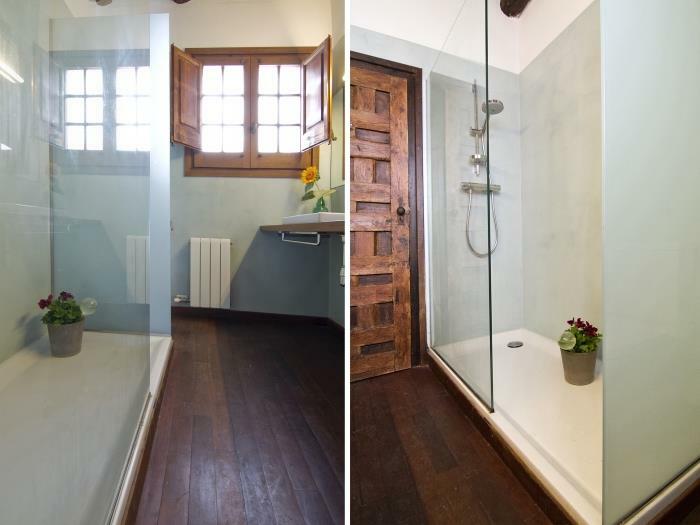 There is a third full bathroom with walk in shower on this floor. 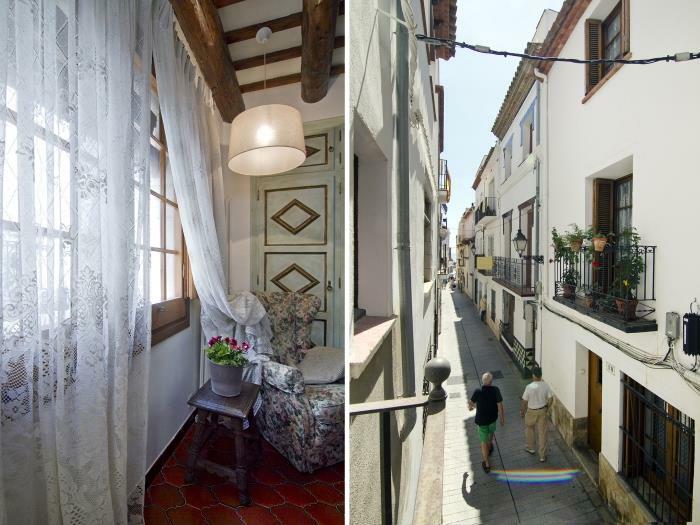 Finally, another flight of stairs leads up to the rooftop terrace where our guests can enjoy stunning views of the old town rooftops and partial sea views. 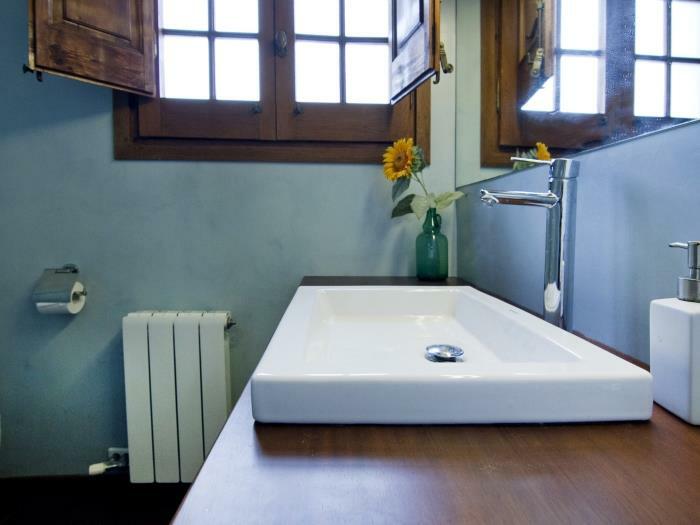 There is a small utility room accessible from the rooftop terrace where our guests will find the washing machine and some cleaning utensils. Thanks to its thick walls the whole property is well isolated against the summer heat but there is an AC unit on the second floor, the hottest one, to provide extra comfort to our guests. 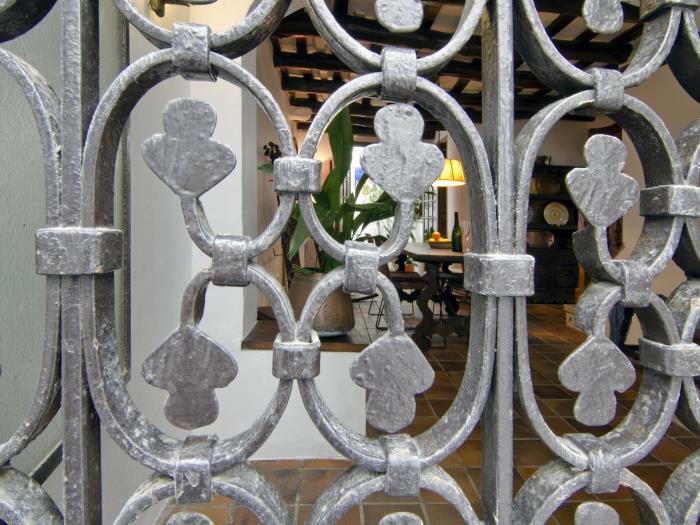 May you visit us during the winter months, the villa is equipped with central heating through hot water radiators. The ANTIK CHARM VILLA provides free wifi to all our guests. We do not recommend this villa to people who may have difficulty with accessing rooms via several staircases and we suggest having the youngest children under surveillance at all times. Please be advised that the villa is located on a pedestrian street so accessing by car to the front door is not possible. 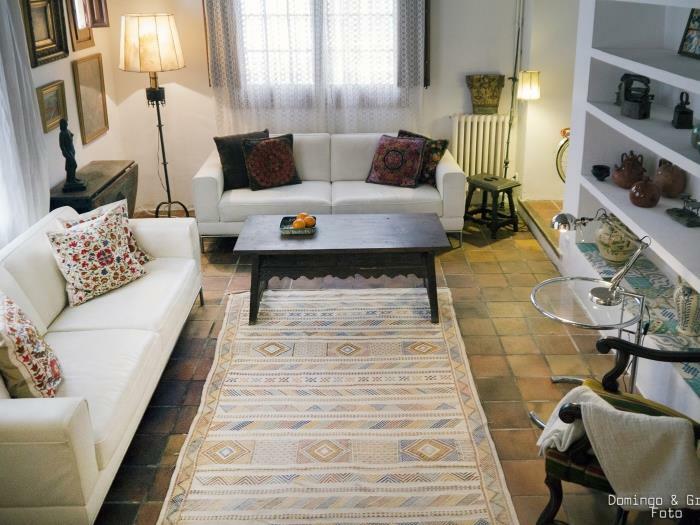 The apartment does NOT have parking but, may you arrive to Sitges with your own vehicle, parking can be arranged in the area for a fee. Just contact us for further info. 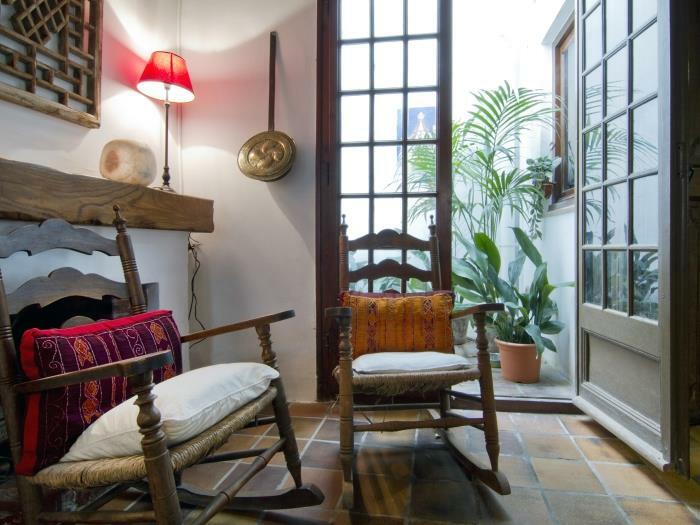 The ANTIK CHARM VILLA in Sitges is a wonderful example of a traditional Sitges property on a quiet street and only steps from the beach with a gorgeous private roof terrace that provides a great escape from the hassle and bustle of the town center. 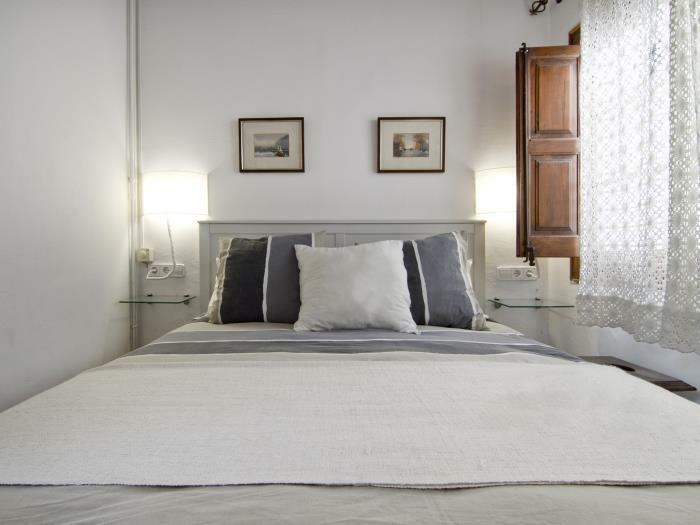 The ANTIK CHARM VILLA is an historic town house located in the old quarter of Sitges, on a picturesque street with white-washed walls that runs directly from the town center to the family friendly San Sebastian Beach. 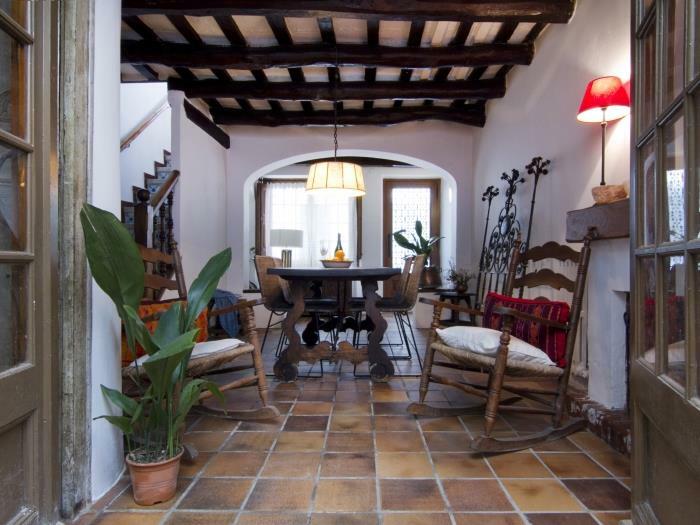 This beautiful villa is only one minute walk from the beautiful promenade with its bars and restaurants as well as the iconic Sitges church and other historic landmarks as the Cau Ferrat or Maricel Museums. 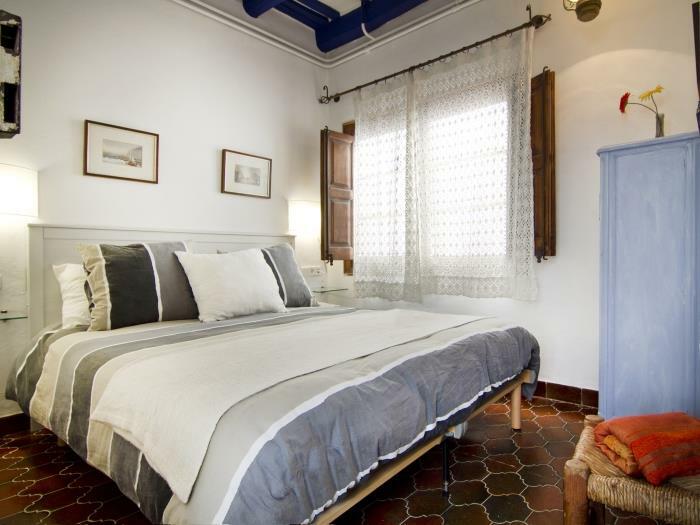 The ANTIK CHARM VILLA has been beautifully restored and partly modernized with all the mod cons in mind but also trying to maintain its antique charm and the typical features of a traditional Mediterranean house such as beamed ceilings, white washed walls, wooden shutters and wrought iron bars. 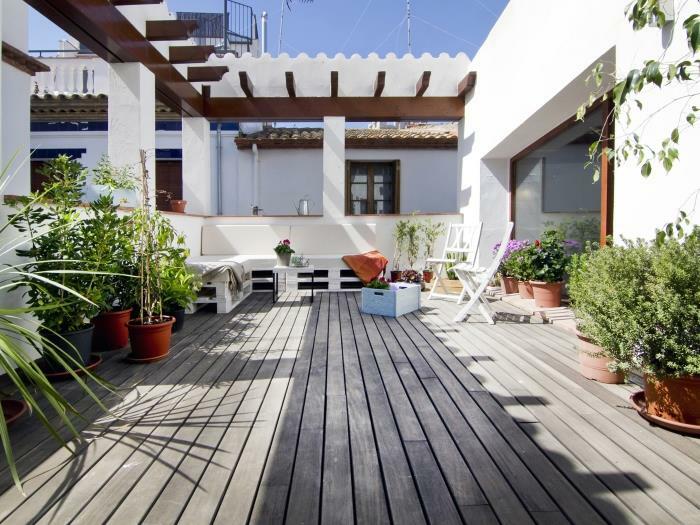 The ANTIK CHARM VILLA is a wonderful example of a traditional Sitges property on a quiet street and only steps from the beach with a gorgeous private roof terrace that provides a great escape from the hassle and bustle of the town center.